If you have ever looked into vegan cooking or cookbooks before you've probably heard of Isa Chandra Moskowitz. Her website Post Punk Kitchen is hugely popular. She wrote several of my favorite cookbooks like “Veganomicon”, “Appetite for Reduction”, and “Vegan Cupcakes Take Over the World”. She has a new cookbook coming out on October 22 called “Isa Does It: Amazingly Easy, Wildly Delicious Vegan Recipes for Every Day of the Week” and I was lucky enough to view a preview copy through Net Galley (librarian perk!). As I mentioned before, I love several of Isa’s other books. This one is no exception! It’s incredibly visually appealing and there are some gorgeous food photos in here. The first section of the book has really helpful cooking/pantry basics, along with my favorite section “Vegan Butchery” which shows you how to make all sorts of shapes with your vegan proteins. She also includes tips on making things easier, and includes a guide to substitutions for various allergies. The recipe chapters are: Soups; Salads; Handheld; Pasta & Risotto; Stews, Chilis & Curries; Stir-fries and Sautes; Bowls (& a few plates); Sunday Night Suppers; A Few Basic Proteins; Breakfast, Brunch & Bakes for the Morning; and Desserts. As evidenced by the sections, there is something in here for everyone. 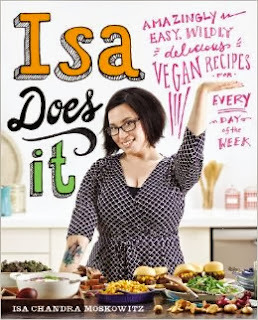 I like Isa’s books because they provide a nice balance between healthy and indulgent recipes that should suit the taste of people like me who eat a very clean diet, or people that get down on pies and cookies. Also, she has recipes that are quick and easy mixed with recipes good for special occasions. Her recipes are very accessible and don’t have too many weird or hard to find ingredients. I've been eating plant based for just under two years, and have scoured blogs and cookbooks for recipes the entire time. I still found plenty of new dishes in this book that I can’t wait to try. First on my list is Shiitake Banh Mis, followed closely by Sweet & Sour Brown Rice Salad and Olive-Lentil Burgers. I’m also intrigued by the Pizza Bowls because I love vegan pizza but have been trying to cut down the gluten in my diet. Hopefully you’ll be seeing some of my re-creations of these recipes on my What I Ate Wednesday posts soon! This book will be a great addition to any kitchen, regardless of what food philosophy you subscribe to.